Enjoy hours of fun outside playing the Triumph 6-Player Croquet Set. This outdoor game requires concentration and strategy, yet it is fun and engaging for players of all ages. Players or teams compete by using a mallet to knock a ball through several wickets arranged on the playing field, scoring points for each wicket. 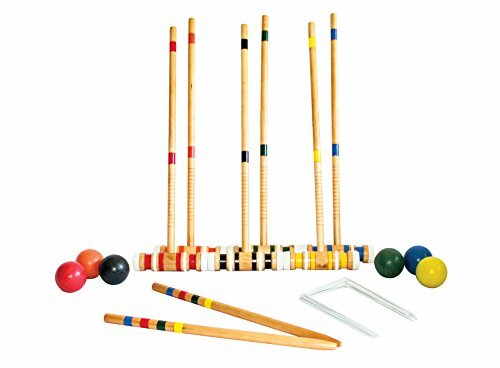 This croquet set comes complete with everything you need including six multicolored solid wood mallets (six 7" x 1.75" heads and six 24" x 0.75" handles), six 70mm balls, nine weather-resistant coated wire wickets, two goal stakes (18" x 0.75"), and a carrying bag. The entire set fits neatly into the carrying bag for easy transportation and storage.